Starts Saturday, January 5 at 11:30 am – Sunday, January 6 at 2:00 pm EST. Stephen Van Rensselaer aka "The Patroon" (or "new patroon," after the death of Stephen Van Rensselaer III in 1839) owned a Century Plant that bloomed in September 1842 while Herman Melville was on the Lucy Ann, nearing Tahiti. Sept. 13 . The American aloe, or century plant, in the patroon’s garden was now in bloom, and had the appearance represented in the engraving. This ancient denizen of the Manor garden, was purchased soon after the revolutionary war, at the sale of a confiscated estate in the city of New York. It was then a well grown plant, and had now been standing in the green house of its present owner nearly sixty years, and was supposed to be between eighty and a hundred years old. For the first time it now gave signs of putting forth a flower stem. When the bud appeared, it grew with astonishing rapidity (18 inches in 24 hours), and attained 21 feet in height; and being a novelty, for very few had ever heard that such a plant existed anywhere, the numbers which visited it were very great, many coming from a great distance—one person came from Ohio expressly to see the phenomenon. --Joel Munsell, The Annals of Albany v. 10 (Albany, 1859), 332. Melville could have read about it later, in newspapers. As Hershel Parker documents in the second volume of Herman Melville: A Biography (page 945), one reminiscence of the Patroon's glorious Century Plant appeared on the same page of the same issue of the Albany Evening Journal (July 13, 1846) with "Toby's Own Story." Toby's tale, written by Melville's shipmate and fellow-adventurer Richard Tobias Greene, helpfully corroborated otherwise doubtful details of their indulgent captivity in Typee. Melville needed Toby's story to authenticate his own, and so rewrote it for a sequel to the main narrative. In published writings by Melville, references to the "American Aloe" or Century Plant occur in Mardi and Clarel Part 3 Canto 27. 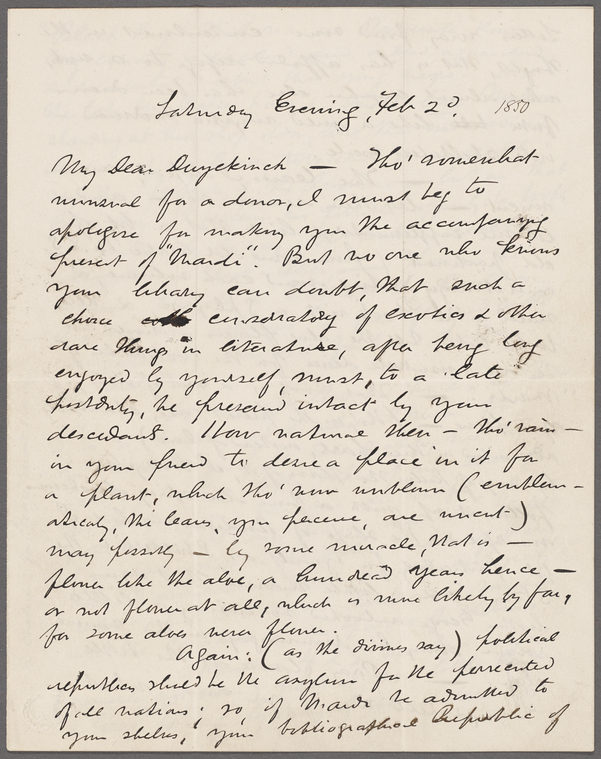 Melville's 1850 letter to Evert A. Duyckinck in manuscript is accessible online via NYPL Digital Collections. 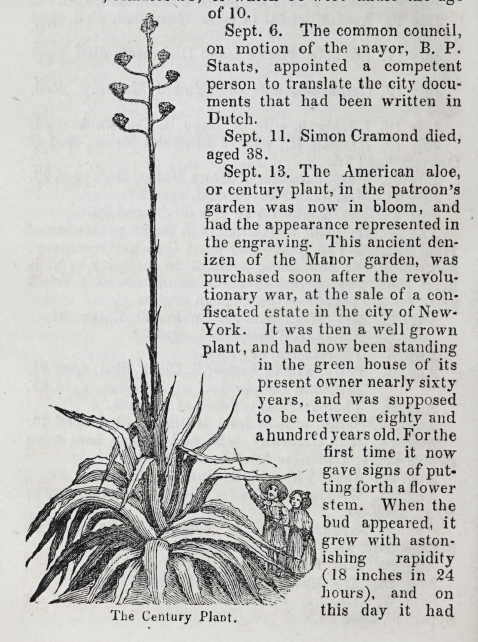 Thousands of people went to see the Patroon's Century Plant in 1842, "all Albany" according to contemporary reports. The Van Rensselaer Aloe was exhibited in New York City with proceeds, reportedly over one thousand dollars, donated to the Albany Orphan Asylum. "During its exhibition at Mr. Thorburn's Saloon, upwards of five thousand persons visited it." --Christian Intelligencer, December 10, 1842. By contrast, only a "few" curious "sight-seers" come to view the plant imagined in Melville's poem "The American Aloe on Exhibition." For bon-bons of the hour. Melville's "American Aloe" is extant in manuscript at Houghton Library, Harvard University, with other manuscript pieces from the posthumously published collection of prose and verse titled Weeds and Wildings. Description Melville, Herman, 1819-1891. Unpublished poems: autograph manuscript, undated. Herman Melville papers, 1761-1964. MS Am 188 (369.1). Houghton Library, Harvard University, Cambridge, Mass. Folder 5. Weeds & wildings with a rose or two. Now anybody with internet can look at manuscript images courtesy of Houghton Library, Harvard University and the Harvard Mirador Viewer. Here's my rough transcription, not bothering much about erasures that you would have to examine the physical manuscript to recover, possibly. Nor recked who came to view. These seldom more than two. What part have I with them? Cleaned up below. Of two choices for line 8 (last line of second stanza), each in its way redundant, "These seldom more than two" seems to me marginally less repetitive and therefore stronger. The handwriting just there looks bolder, too, so I'm inclined to keep it despite restore marks that justify the preference for "Nor recked who came to view" in the Northwestern-Newberry edition. Robert Faggen gives "These seldom more than two" in the 2006 Penguin edition of Selected Poems, following the 1924 Constable edition (The works of Herman Melville v.16 (London: Constable, 1924), 321. Granted, the Constable edition often proves untrustworthy. In "Aloe" alone, for example, the readings "And While" and "Now long" are wrong. Well, Hennig Cohen I see reads "Now long" in his Selected Poems of Herman Melville. But "Now" for "How" illustrates the old problem, meticulously explained by William H. Gilman in 1946: Melville's "H" looks like "N," hence the name "Norman Melville" on the crew list of the merchant ship St. Lawrence, bound for Liverpool. As presented in Melville's "Aloe" poem, the exhibition is cheap (10 cents) and poorly attended. He can't have in mind the sensationally popular exhibit of the Patroon's Century Plant in 1842, unless he never learned how well attended it really was. Not likely that Melville remained so ignorant, since the wondrous Albany Century Plant was still remembered in 1872, decades after it flowered in Stephen Van Rensselaer's garden. The magnificent plant of Melville's "American Aloe," like the rarer achievements of art that it represents (or has often been taken to represent), does have admirers, the "few" spectators whom the unnamed "patriarch" beholds like The Maldive Shark or The Berg or Bartleby's Wall Street wall: showing no human empathy for viewers or their feelings, only "strange inert blank unconcern." Few as they are, even these admirers are regarded as "sight-seers," tourists. While nations come to praise its grand array! In "Blossoming of the Aloe"
And similarly in "The Century Plant,"
In which the century flowers appear. --John Cruikshank, Washington, D. C. Capital, May 28, 1876. So the aloe image in Clarel Part 3 Canto 27 presents a plant unable to bloom, as Cody Marrs observes in Clarel and the American Centennial, Leviathan 13 (October 2011) at 105. In Melville-Habbibi's darkly prophetic vein, the blighted century-plant figures the century-old nation, scarred and stunted by civil war. But that aloe is a cryptically expressed metaphor. That aloe is not our "American Aloe on Exhibition" in Melville's uncompleted "Weeds and Wildings" project. This aloe flowers, however belatedly. And talks about it. 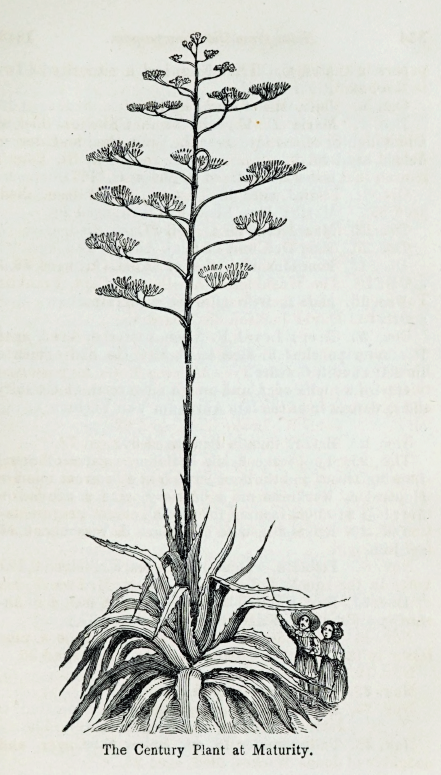 In 1886, thousands flocked to view an offshoot of the Patroon's Century Plant exhibited in Auburn, New York by one George Casey, Esq. Generous and mindful of guests, so nothing like Melville's stony "patriarch,"
Two years later in Boston, the advertised price of admission ("ONLY 10 CENTS"), matched the cheap ticket that Melville posits in "American Aloe." Thousands came to see that blossoming century plant at Horticultural Hall: 7000 persons in one afternoon according to the Boston Globe of September 26, 1888. Where on earth is the counterpart of Melville's "patriarch"? Maybe nowhere. After all, "American Aloe" is a work of imagination. And no century plant really soliloquizes at night like the one in Melville's poem. 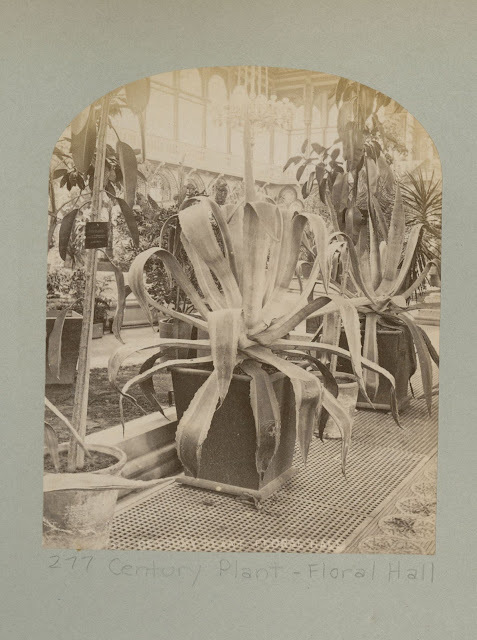 Still, I can't help wondering: was there ever a real exhibition of a real century plant, in Philadelphia, 1876 or anywhere, anytime, to which "few" people came? Here's one closer to Melville's home in New York City: a century plant "on Exhibition" for several months in 1872, next to Wallack's Theatre on East Thirteenth Street. Advertised price of admission in May 1872 was "50 cents; Children, 25 cents." This Thirteenth-Street Century Plant was in full bloom by July. The century plant on exhibition in East Thirteenth street is just now at its best--the stalk showing the perfect flowers, the buds, and the clusters part blown. The plant was brought from Jacksonville, Fla., is twenty-five feet high, and contains about five thousand flowers and buds upon its stalk. The flowers are of sulphurish hue, and the stamens resemble those of a lily. Considering that it dies as soon as it has flowered, the question arises, Was it worth while to live so long to accomplish so little? Herman Melville's portrayal of the committed "Indian hater" John Moredock, retouched from some version of the popular frontier narrative by James Hall, was reprinted from chapter 27 of The Confidence-Man in the Boston Saturday Evening Gazette (April 4, 1857) and other newspapers. Of those found so far, most reprintings of "The Indian Hater" cite The Confidence-Man and acknowledge Herman Melville as the author. The Illinois State Chronicle published the extract anonymously, without credit to Melville or any source. An Extract from "THE CONFIDENCE-MAN: HIS MASQUERADE, by Herman Melville," Author of "Typee," etc. Just published by Dix, Edwards & Co., New York. "The following account of Colonel John Moredock, a celebrated Indian fighter, is from Herman Melville's latest work, "The Confidence Man," just published by Dix, Edwards & Co., New York." Philadelphia Saturday Evening Post [April 25, 1857--inferred from New York ad, not yet verified]. "THE INDIAN HATER. 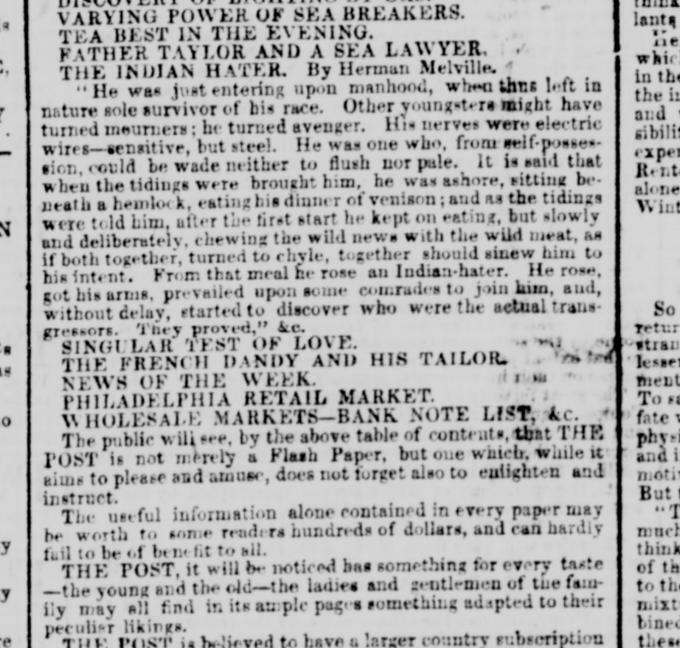 By Herman Melville" announced in New-York Daily Tribune ad on Thursday, April 23, 1857 as forthcoming, along with many other selections from recently published works of popular literature. via Chronicling America: Historic American Newspapers, Library of Congress. Illinois State Chronicle (Decatur, Illinois), June 4, 1857. Anonymous; no source credited. In England, as Hershel Parker observes in volume 2 of Herman Melville: A Biography (Johns Hopkins UP, 2002), Reynolds's Newspaper gave two selections from the matter of John Moredock in "tardily" reviewing The Confidence-Man on June 14, 1857. 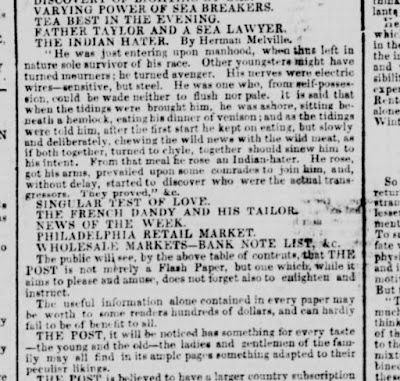 The notice of The Confidence-Man in another London publication, The Saturday Review (May 23, 1857), found "the story of Colonel John Moredock, the Indian hater" appealing as a horror story. "We likewise recommend to those readers who like tales of terror the story of Colonel John Moredock, the Indian hater. It opens up a dark page in American history, and throws some light on the feelings with which the backwoodsmen and red men mutually regard each other, and apparently with very good reason." The sketch is curious and valuable as the portrait of a species. We can hardly acquiesce in the assertion that a man who loved to kill Indians, and in whose breast the spirit of revenge could so long and powerfully predominate, was not "cruel by nature," but "kind, generous, and benevolent." --Editorial preface to "COLONEL JOHN MOREDOCK" as reprinted in the New-York American, for the country on December 4, 1829; found at Fulton History. Transcribed below, the entire article as reprinted in the Philadelphia National Gazette on November 27, 1829. We take the following notice from the Illinois Intelligencer. The sketch is curious and valuable as the portrait of a species. We can hardly acquiesce in the assertion that a man who loved to kill Indians, and in whose breast the spirit of revenge could so long and powerfully predominate, was not "cruel by nature," but "kind, generous, and benevolent." In our last paper we had the melancholy duty to perform of announcing the death of Col. John Moredock--a man who was particularly distinguished in the early history of this country, and whose name deserves a more special mention than the brief obituary which we then published.-- This gentleman came to Illinois more than forty years ago, when the only white inhabitants in this Territory were comprised in the French settlements on the Mississippi. The French having lived peaceably with the Indians, a few American families came out about the time we have mentioned, and, being more enterprising than the old inhabitants, began to spread out into the interior. The Indians resisted these encroachments, and the barbarities which had been acted in Kentucky and Ohio, began to be perpetrated in Illinois. Among the emigrants was the mother of Col. Moredock. She had been married four times, and all her husbands had been murdered by the Indians, in Kentucky and in Indiana; yet, strange to tell, this undaunted woman, who seemed destined to suffer all the cruelties of border warfare, left Vincennes in her fourth widowhood, with the purpose of proceeding to Illinois with her children. Pursuing the circuitous route then usually travelled, and the only one that was then practicable, she descended the Wabash and Ohio rivers, and was ascending the Mississippi, when the whole party was surprised and murdered by the Indians.-- Mrs. M'Fall, for that was her name, perished with all her children, except John Moredock, then about 15 years old, who was not with his mother, having gone with another company. Moredock thus found himself in the situation so pathetically described by the celebrated Logan--not a drop of his blood ran in the veins of any human creature; and being by nature generous and ardent, all his tenderness for these who were dear to him was awakened; and turned into revenge against their brutal destroyers. He became emphatically an Indian hater, and continued through life to consider it a virtue to make war upon the savages. The Indians who massacred his mother were known to be part of a tribe who resided near New Madrid, and to that place they were traced by a party sent out to revenge the murder, but being secreted by the Spanish commander stationed there, they at that time escaped the vengeance of the whites. But they could not escape the vigilance of Moredock, who having learned that they came up every season to hunt in the neighbourhood of Kaskaskia, watched for them from year to year. Two or three years after the murder, having heard that this party was in the neighborhood, he raised a small company, and gave chase to them, but the Indians escaped. On the following year they came to their old hunting ground again, and Moredock surprised them as they lay hid on an island in the Mississippi, and the parties being nearly equal, a bloody battle ensued, in which the whole of the Indians, who were 17 or 19 in number, were slain, except three, who escaped by plunging into the river. A year or two after he surprised seven of the same tribe, and slew them, and felt gratified in the belief that he had now sacrificed all the murderers of his mother and her infants. He continued to make war upon the Indians, and is supposed to have never lost an opportunity of gratifying this master passion of his soul. Yet he was not cruel by nature; on the contrary, he was kind, generous, and benevolent, sincere and warm in his friendships, punctual in his engagements, and possessed of a more than ordinary degree of calm deliberate courage. He excelled in all the manly exercises incident to a frontier life, and had few equals in strength, activity or hardihood. He was a mighty hunter; skilled in all the artifices of the chase, fond of roaming through the woods and sleeping by his campfire, and delighted in all the vicissitudes of these adventurous scenes. 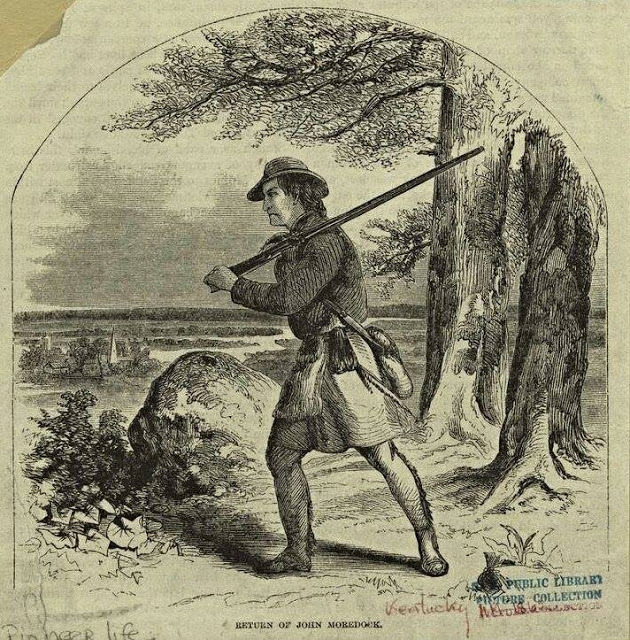 In the woods, his prudence was as great as his skill, and the best woodsmen loved to hunt in company with one who was so watchful, so expert, and in the worst emergencies so true to his friend--but woe to the Indian who crossed his path. During the last war with Great Britain, a law was passed by Congress in 1812-13, for raising ten companies of rangers for the protection of the frontiers of Indiana and Illinois, and Moredock was immediately pointed out by common consent as the person best qualified to command that portion of the force destined for Illinois. The Territorial Legislature accordingly recommended him for the appointment of Major; and Samuel Whitesides, James B. Moore, and Moses Short, for captains. It turned out, that the law did not provide for any field officers; the gentlemen recommended for captains, lieutenants, and so on, were appointed, and Moredock enlisted as a private, and served cheerfully in that capacity until on the occurrence of a vacancy, his company elected him to the office of Ensign, which he accepted. This conduct of Mr. Moredock, in serving in the lowest capacity, after being led to expect the highest, speaks more in praise of his patriotism, and goodness of heart, than any thing we could write. He served with the Rangers through the whole war; and the oldest settlers of Illinois, who recollect those things, know well how much the country owes to the gallantry of those brave men. These troops were formed out of the inhabitants of the country--they were woodsmen, mounted, and armed with rifles, and enlisted for one year. They scoured the frontier in small parties, rallying upon the stations built by the inhabitants and keeping a continued watch upon the Indians. Their services were arduous and valuable, and deserve to be held in grateful remembrance by the people of Illinois. Mr. Moredock was afterwards Colonel of the Militia of Monroe county, and represented his fellow citizens in the Territorial Legislature. He was a that time one of the most popular men in the Territory, and might have aspired to its highest offices, had he been ambitious; but he loved his rifle, and his comfort, better than power and office, and after serving his country faithfully in the day and hour of trial, was content to enjoy in a private station the respect and confidence of his fellow citizens. In the course of his life Moredock is said to have slain thirteen Indians with his own hand, and perhaps the truth rather exceeds than falls short of this statement. Those who have passed their lives in security, by the domestic fire-side, blessed with the kind protection of Providence and the comforts of social life, may shudder at the recital of such adventures; but let no one condemn the subject of this hasty sketch, unless like him he has seen the vital spark extinguished by the hand of violence, from every heart that beat in alliance with his own. Let it be remembered, too, that he slew only the enemies of his country; and while ye crown with laurels the heroes who have commanded our ships and led our armies, let us not forget to honour the ranger who has defended the female and the infant from all the dreadful atrocities of savage warfare. --The National Gazette, November 27, 1829; reprinted with the Gazette preface included in the New York American for the country (December 4, 1829); and, without the added preface, in the New York Evening Post (December 4, 1829) and New York Spectator (December 10, 1829). 27 December 1700. --Journals of the House of Commons v. 13 1699-1702, page 404. With respects to Mr. Benson and all at Salisbury-court; wishing your Lordship and them an happy Christmas, and many good New Years.... --Letter "From Mr. Joseph Nicolson" dated December 22, 1707 in Letters on Various Subjects (London, 1809), volume 2, page 338. 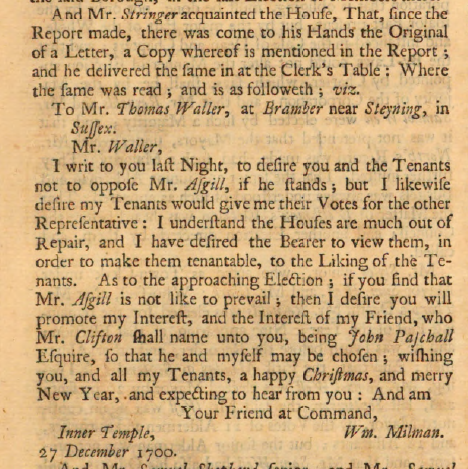 I am, Madam, &c. --Letters Written by His Excellency Hugh Boulter (Dublin, 1770), volume 1, page 198. Dar as boas festas a alguem, to wish a happy Christmas, or Easter to one, to wish one the compliments of the season. --Anthony, Vieyra, A Dictionary of the Portuguese and English Languages (London, 1773). In December 1833 Herman Melville was fourteen, living with his mother and siblings in Albany. His older brother Gansevoort turned eighteen that month. Now in the business of making and selling fur hats, Gansevoort was regarded as the man of the family after their father Allan Melvill died in January the year before. Hershel Parker's chapter for this time is titled, "In the Shadow of the Young Furrier" (Herman Melville: A Biography V1. 84-103). Withdrawn from school, Herman worked as a clerk for the New York State Bank. His mother's brother Peter Gansevoort was one of the Directors there. Earlier in 1833 Peter and another uncle, Herman Gansevoort, opened Stanwix Hall (originally to be named "The Pavilion"). On December 6th, Gansevoort Melville's birthday as well as the traditional feast day of St. Nicholas, the St. Nicholas Benevolent Society of Albany held its annual banquet in the brand new building. Naturally, festivities 185 years ago included congratulations and formal toasts to and by the proud landlords: Herman Melville's Dutch-descended uncles. New York Governor William L. Marcy made it to the affair, along with the Lieut. Gov. John Tracy. Martin Van Buren, then Vice President of the United States, unfortunately had to send his regrets. Former Chargé Rutger B. Huygens was the most prominent of guests actually from the Netherlands. The toasts that night make intoxicating reading. Herman Melville's former school principal T. Romeyn Beck toasted Herman's maternal grandfather Peter Gansevoort, Hero of Fort Stanwix. The memory of Col. Marinus Willett, a patriot and soldier of the revolution. 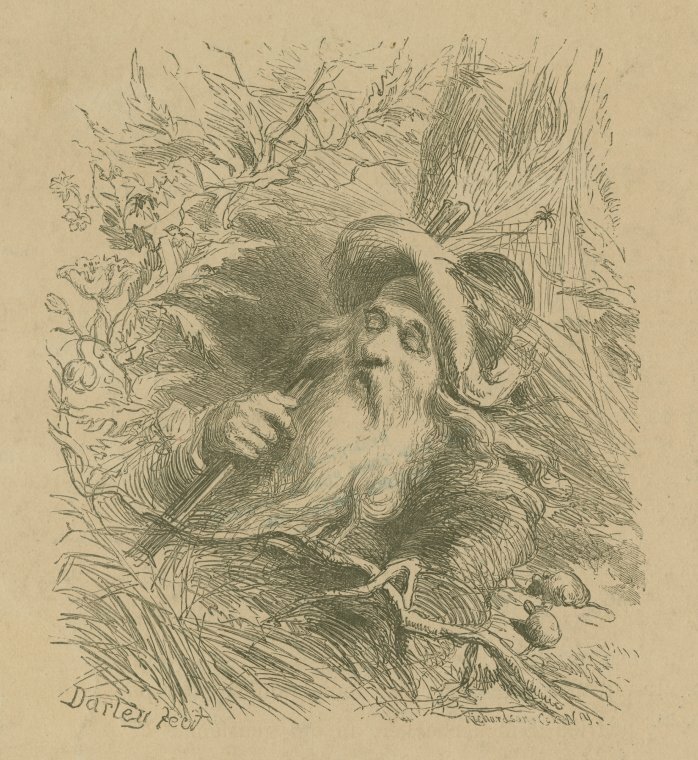 The memory of Rip Van Winkle--He being dead yet "sleepeth." Excerpts below are from the report in the Albany Evening Journal on Friday, December 13, 1833; reprinted in the Albany Argus on December 16, 1833. Both issues are accessible online via fultonhistory.com. OF THE CITY OF ALBANY. The anniversary festival of this society was celebrated on the evening of the 6th inst., at the large room of Stanwix Hall--the splendid and substantial building recently erected by the Messrs. Gansevoort. The room was beautifully decorated with various appropriate banners, devices, festoons and other ornaments, in which Orange was the predominant color. Through the politeness of several gentlemen, many portraits of distinguished individuals of the olden time of Dutch descent, were politely loaned for the occasion, and added much to the interest of the decorations. Among them were those of Jeremiah Van Rensselaer, the second Patroon; Philip Livingston, one of the signers of the declaration of Independence; Abraham Yates, formerly Mayor of the city; and Gen. Abraham Ten Broeck. Opposite the centre panel of the gallery, the portrait of Gen. Gansevoort, with that of his brother Judge Gansevoort on the one side, and Col. Varrick on the other. Busts of various distinguished individuals were also placed in appropriate situations about the room. Among others, were those of Pierre Van Cortland, Alexander Hamilton, De Witt Clinton, and John V. Henry. Several fine paintings and engravings from the collection of John Meads, Esq., were also politely loaned by him for the occasion; and under the guidance of his established and excellent taste the decorations were arranged. The room was opened in the afternoon for the reception of visitors, and many hundreds of ladies and gentlemen took the opportunity of viewing the table and decorations. At 8 o'clock the members of the society, together with their guests, sat down to a table most sumptuously prepared by Mr. Charles F. Rice, late of the Pavilion at Saratoga Springs, who has taken the refectory connected with the Hall. The bill of fare, in addition to the national dishes, contained all that could be wished or desired, and did honor to the host and the occasion. The venerable Abraham Van Vechten, Esq., President of the society, presided at the table, assisted by Harmanus Bleecker, Esq., as 1st Vice President, Jacob Ten Eyck, Esq., as 2nd Vice President, and Peter Gansevoort, Esq., as 3d Vice President. Among the guests were Rutger B. Huygens, late Chargé of his Majesty the King of the Netherlands to this country; his Excellency Gov. Marcy; Lieut. Gov. Tracy; the Mayor; Gen. Pierre Van Cortland of Westchester county; Guert Van Schoonhoven, Esq., of Waterford; S. F. B. Morse, Esq., President of the Academy of Design; Rensselaer Schuyler and Herman Gansevoort, Esqs, of Saratoga county. I. Netherland--Our father land. Auld Lang Syne. II. The President of the United States. Hail Columbia. III. The King of the Netherlands--True to his great name; true to his illustrious house; true to a patriotic people. God save the King. IV. The memory of William the first, Prince of Orange--Tolerant in an age of bigotry; liberal, when all around were tyrants. Marseilles Hymn. V. The memory of Grotius--An illustrious example of moral and intellectual power: a private individual in adversity and in exile, he gave law to the law-givers of Christendom. Roslin Castle. VI. The memory of the Rev. Dr. Eilardus Westerlo--The learned and pious man; the dignified and affectionate Pastor. Adeste fideles. VII. The Schoolmaster--The mighty conqueror, whose march no holy or unholy alliance can oppose. Flow on thou shining River. By the President. Baron Huygens, the late resident Minister in the United States, of a nation we delight to honor--A gentleman whose official conduct and private virtues, entitle him to our profound respect. By the First Vice president, Harmanus Bleecker, Esq. Massachusetts--A republic, founded on board of the May Flower, in 1620, and yet exhibiting unsurpassed happiness, and the complete dominion of law and order. By the Second Vice President, Jacob Ten Eyck, Esq. Our Guest, Rutger B. Huygens, late Chargé of the Netherlands--For his own sake, for his fathers sake, we are gratified that this festival is distinguished by his presence. The St. Nicholas Benevolent Society of Albany--Whose members throw, by their patriotic exertions, a new splendor upon the virtues of a glorious ancestry.--May the band of brotherly love between children of the same family connect them closer and closer every day. By Volkert P. Douw, Treasurer of the Society. May the ebbings of our treasury be replenished by floods of liberality; and our dollars, in the cause of benevolence, be kept as bright as our grandmother's copper kettles. THE FESTIVAL OF ST. NICHOLAS.--A link connecting the past with the present--may it extend to the future. "The virtue, firmness and constancy of our Dutch Ancestors, and of the Williams of Orange--May these high qualities always be remembered, and, if necessary, imitated by their descendants on both sides of the Atlantic." The Lion of the Netherlands, and the Eagle of the United States of America--Noble emblems of both Nations--Honor and Independence. Dr. Herman Wendell, one of the Managers, then proposed the health of Mr. Zimmerman, which was drunk by the company. ... The health of the Baron [Minister of foreign affairs, Baron Verstolk van Soelen] was then drunk. After which, Dr. Barent P. Staats, one of the Managers, gave as a sentiment. Our distinguished fellow member, Martin Van Buren--Who, by his magic power, has fully demonstrated himself a true descendant of St. Nicholas. … I am too well aware, Gentlemen, of the feelings which animate Baron Verstolk Van Soelen, not to offer you in his name the following sentiment. The United States of America--Their Star Spangled Banner is a noble emblem of the motto of our ancestors--"Eendragt maakt maght." ... The health of Mr. Lauts was then drunk. A letter from Mr. Bierman, of Amsterdam, to Harmanus Bleecker, Esq. 1st Vice President of the Society, was then read--after which, the toast proposed by him was drunk by the company. ... The health of Mr. Bierman was then drunk. A letter received from Hendrik Kuyper of Rotterdam, accompanied by two poems of his--one on the eighty years war, and the other a eulogy of Admiral Pieter Pieters Hein, addressed to the 1st Vice President--was communicated to the society, and the health of Mr. Kuyper was drunk. A letter from B. Thooft, Esq. of New York, to the 1st Vice President, was then read, in reply to an invitation from the Managers to attend the festival, regretting his inability to do so, and enclosing a toast, which was drunk by the Society.-- The following is the toast. The memory of the illustrious patriots and statesmen, Kornelis and John De Witt--The admiration of their countrymen and of the world. The health of Mr. Thooft was then drunk. By Egbert Egberts, Esq. one of the Managers. Industry and perseverance--Characteristics of our Dutch ancestors. "The memory of General Peter Gansevoort." For this compliment, so unexpected--so flattering--permit me, Mr. President, to return to this company, the warmest thanks of the proprietors of Stanwix Hall. They have erected this spacious building on a site, which, under the blessing of Divine Providence, has descended to the sixth generation. As the recipients of this blessing, they are humbly grateful. This Hall, in compliance with the expressed wish of our fellow citizens, bears a name in reference to an important event in our Revolutionary History--a name associated with an actor in that scene, who was cradled on this very spot, and whose memory is most dear to its present owners. If the proprietors, actuated by the spirit of the times, have reared a structure, which not only adds to the embellishment of their native city, but affords conveniences so long required for the exhibition of works of art, and suitable and ample accommodations for those public amusements, innocent in themselves and indispensably necessary in a large and growing commercial community, they have accomplished their intention, and experience a high satisfaction, which is greatly increased by the moral spectacle now exhibited in this Hall. The President and other Officers of the St. Nicholas Benevolent Society--We thank them for their spirited exertions, indicated by this sumptuous banquet and these splendid decorations. As representatives of a society, based on benevolence, they have higher praise in their prompt ministrations to the wants of the poor. Holland--Endeared to the descendants of the New England Pilgrims, as the first Asylum of their persecuted forefathers. By John B. Van Schaick, one of the Managers. The memory of Laurens Koster, of Haerlem--Printer, 1430--The early and conspicuous promoter of the art, which gives wings to thought, and renders the products of genius, the common property of mankind. By His Honor, the Lieutenant Governor. The Albany St. Nicholas Society--Its members well sustain the patriotic and honorable character of their Ancestors. By G. W. Ryckman, one of the Managers. The characteristics of our Ancestors--Industry, frugality, virtue, courage and hospitality--Let the sons of St. Nicholas emulate the noble example of their forefathers. Mr. President:-- I believe the national character of the Dutch, for Heroic Patriotism, and desperate resolution, is proverbial, and, although it has frequently been asserted, that they have degenerated from their former reputation, I believe the same inherent principle, still remains. The obstinate defence of the Citadel of the City of Antwerp, of a very recent date, is strong evidence that it is not extinct. Their courage and their Heroism was crowned with success. They had already opened their sluices, and inundated the country. But the Spaniards obstinately pressed the Siege. In the mean-time, Admiral Brissot, with a fleet of flat-bottomed boats, calculated to navigate the deluged country, aided by a strong wind, which drove the water, with violence against their works, compelled them to raise the Siege, after losing the flower of their army. There was a remarkable circumstance attending this memorable Siege, which, I think, is worth mentioning: during the whole of this period, the inhabitants of the city carried on a correspondence with other places, by means of Carrier Pigeons.-- Several of those Pigeons were embalmed and are preserved in the Town House of Leyden, in commemoration of this event. I now, Sir, give you--Dutch Courage, and Dutch Patriotism. Gen. Van Cortland. Albany--with a strong stamp of the Dutch upon it--it will not cease to be respected and admired until frugality, honesty, and, hospitality cease to pass current as virtues in the world. John Van Buren, one of the Managers. De Stad Saardam--An wien behoort de Eer van een der gooteste mannen van latere tyden tohebben opgekweckt. Gen. Van Schoonhoven, of Waterford. The British Tourists--A little of Dutch honesty imparted to their journals would render them more just to the American, as well as more honorable to the British character. Judge Vanderpoel. Our mothers, and their daughters--Characterized by intelligence, frugality and neatness. Our happy homes bear testimony to their virtues and their worth. Simeon De Witt, Esq. Our Atavi more noble than the Atavis regibus of Maecenas--His fought, conquered and triumphed to entail slavery and misery on the earth. Ours fought, struggled, suffered and died to entail liberty and happiness on their posterity. T. Van Vechten. The memory of Abraham Yates, former Mayor of the city of Albany--The sturdy rough hewer. A strenuous opponent of oppression in every form, and a decided advocate for the rights and liberties of the people, during the dark days of the revolution. George M. Bleecker, one of the managers.--Commerce and liberty, the glory of Holland. D. Graham, Jr. Esq. of New York. The ancient city of Albany--May it ever be the happiness of strangers, as it is now, to acknowledge its hospitality. Dr. Herman Wendell, one of the managers.--Our Dutch Ancestry--May we, their descendants, ever cherish their memory, and revere their worth. General Solomon Van Rensselaer. Leeuw van Holland en de Arend van America--Moogen zy als blicksem stralen on de vyandem van vryheid springen. The Lion of Holland and the Eagle of America--May they pounce like lightning upon the enemies of freedom. John Meads, Esq. a guest. Stanwix Hall--The new temple of St. Nicholas--May it always hereafter be toasted, yet never be burnt. Rensselaer Schuyler, Esq. of Saratoga county. The prince of Orange--May he ever be successful in guarding the liberty of his country, and expelling English pensioners from the soil of his ancestors. C. W. Groesbeeck. The Dutchmen of Albany. May they emulate the improvements and spirit of the age. J. Blunt, Esq. of New York. Dutch Hospitality--As warm hearted in its welcome of the stranger here, as when it sheltered the exiled Pilgrims in the father land. P. V. Shankland. The city of Albany--Its inhabitants exhibiting the unwearied industry, and practical sagacity, associated with the ancient name of Beverwyck, proudly point to their present prosperity, as the result of these qualities. 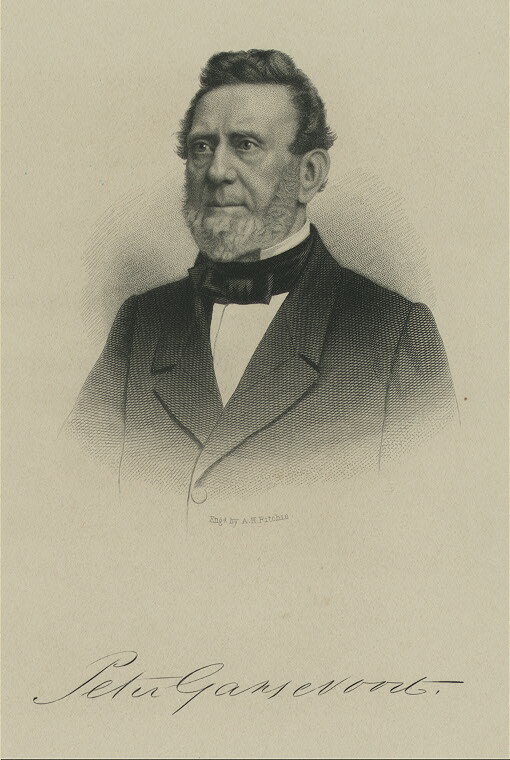 S. F. B. Morse, Esq. of New York. Holland--The hospitable asylum of the Puritans, and the land of Reubens and Van Dyck: descendants of the former, and admirers of the latter, may well connect with thanks for present hospitalities, grateful recollection of the generosity of the Vaderland. C. C. Sebring, esq. of New York. The pilgrim voyagers in the Goede Vrouw, who, under the patronage of St. Nicholas, laid the foundations of this great states--may their descendants ever be as celebrated for their probity and social virtues, as they are for their enterprising public spirit. Wm. Smith. Integrity, the pride of our ancestors--May our children imbibe their principles. C. A. Ten Eyck. The St. Nicholas Society--Not the least among the societies of this republic, for out of thee may yet be called a ruler to preside over the people. L. Cruttenden. The St. Nicholas Benevolent Society of the city of Albany--It has caused many tears of joy to flow, by wiping the tears of sorrow from the eyes of the widow and the fatherless. Adjutant General Hubbell. The memory of Count Van Polanen--A noble and learned Dutchman, who represented his country with honor in the four quarters of the globe, and retired to this land of liberty to spend the evening of his life.-- He died, during the present year, at Bridgeport, in the state of Connecticut, a true friend to freedom, to literature and to the christian religion. Doct. Peter Wendell.-- May our strong predilections in favour of Dutch Presidents continue, and increase until their benign and salutary influence shall be felt and acknowledged from Georgia to Maine, and from the Atlantic to the Mississippi. Herman Gansevoort, of Saratoga county. The memory of Col. Marinus Willett, a patriot and soldier of the revolution. Cornelius Egberts. The memory of the brave Van Speyk. W. W. Groesbeck. May Dutchmen never forget to celebrate the annual festival of St. Nicholas. Silas C. Herring. 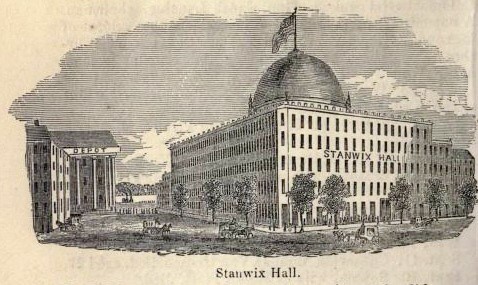 Stanwix Hall--Its granite walls are no unfit emblem of the enduring glory of the hero of Fort Stanwix. George Brinckerhoof. Unhappy Poland--She claims and has our sympathies. H. H. Martin. Our Dutch Vice President, Martin Van Buren.--At the anniversary of St. Nicholas in 1837, may he be smoking his pipe in the "east room" at Washington. William Seymour. The Messrs. Gansevoort, descendants of a revolutionary patriot, (and one of that noble phalanx of Dutch patriots,) they have displayed an enterprizing spirit worthy their illustrious ancestor, in erecting this magnificent edifice, which, while it adorns the city and affords the most splendid accommodations to the St. Nicholas Society, also hands down to posterity the birth place of the Hero of Fort Stanwix. Cornelius Ten Broeck. The late Peter Van Schaack of Kinderhook.--His name is a proud one among those of "our fathers in the law." J. Rhoades. Martin Van Buren, our Dutch Vice President.--The ides of November, 1836, will purge all sin from his title. Isaac W. Staats. The memory of Col. Richard Varick, a patriot of our glorious revolution.--He lived rich in the esteem of his fellow citizens, and full of good works he has departed, ripe in years and rich in faith: Let such men not be forgotten. A. M. Strong. Dutch character.--But another name for Industry and Integrity. W. H. Staats. The memory of DeWitt Clinton. Torn rudely from its sparkling diadem." S. S. Benedict. Dutch Girls--The fairest and rarest among the daughters of men. Dr. A. Groesbeck. The Dutchman's Pipe--"May its shadow never be the less." D. P. Marshall. The city of Albany--Founded by the Dutch--may it continue to the latest posterity to sustain a population as prosperous and happy as were the families of its founders and their immediate descendants. Charles N. Bleecker. The Dutchmen of the old school--Practical illustrations of the fact that these are "piping times of peace." Wm. H. Fondey. The Torch of Science--Which hath lighted to the Escurial the Philips and the Alvas of the earth. H. Ames. The citizens of Albany, and her sons in the councils of the nation--May their efforts be united in the removal of the deposites from the Overslaugh. By a guest. Knickerbacker and other venerable Dutch names--May we always know how to spell them, and thus prove that we are not ignorant of their origin and signification. Stephen Groesbeck, Esq. of Watervliet, being called upon for a toast, addressed the chair as follows. General Chasse--the heroic defender of the city of Antwerp. Charles B. Lansing. The phlegmatic character of the Dutchman, lost in imparting his hospitality. Mr. Pruyn. The Fair--Our guardian angels.--In childhood we are nursed by their care--in youth our characters are formed by their influence--in manhood our joys and sorrows are sanctified by their participation of our lot. With grateful affection we say--Love to them all. 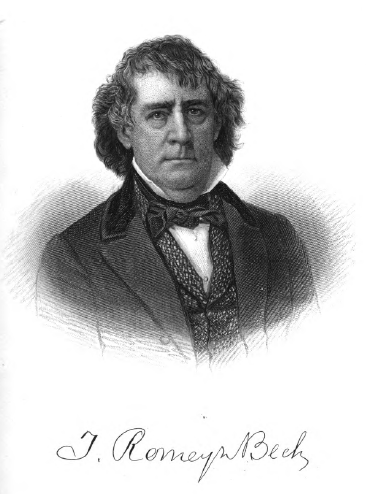 J. P. Bradstreet. The present festival an appropriate christening to the monument of the illustrious defender of Fort Stanwix. W. H. De Witt. The Sons of Amsterdam, Rotterdam, Schiedam and the other Dams of Holland--may their known valor and patriotism always form an impervious Dam to the enemies of their country's rights. P. H. Ostrander. The memory of our illustrious Washington--The greatest and best of men. His character, like the pyramids of Egypt, will forever stand the unrivalled object of our admiration. John Knower. The Dikes of Holland--A lasting monument of the energy and perseverance of the Dutch. D. B. Slingerland. The genius of temperance which sheds its balmy influence over our western hemisphere--May its healthful blessings visit all the nations of the earth. R. V. De Witt, read an extract from a letter from James Stevenson, Esq. one of the members of the society now in Europe, referring to the hospitality he had received from Mr. Matthiesen, residing in the vicinity of Haerlem. The health of Mr. Matthiesen was then drunk, followed by that of Mr. Stevenson. Henry Bleecker, Jr. The revolution of the seven Provinces--As the character of their people was mild and pacific, their achievements of valor were brilliant, as the yoke of tyranny had been cruel and oppressive, their emancipation was glorious. Wm. E. Bleecker. The history of Holland--As a record of events, it is a repository of wonders: as a biography of a nation, a monument of glory. J. C. Van Schoonhoven. St. Nicholas--May the name ever be reverenced by the descendants of Dutchmen. Her Horticulturists--Men of correct taste. Dr. J. F. Townsend. The industry of our ancestors--Exemplified in their habits of patient thinking, laborious attention, and close application. P. Carmichael. Virtue, wisdom and patriotism, the chief materials in a Dutchman's character. John C. Staats. Henry Hudson--May his memory be cherished as long as the noble stream which wafted the adventurer to this happy shore, shall wear his name and roll in its mighty channel. Mr. Whale being called upon, remarked that at the moment he could think of no sentiment of his own worthy of offering, and therefore begged the company to accept one which he had somewhere seen in rhyme. And moulded then the Dutchman's heart. L. Fidler. Dutch Supper--A cognomen significant of intellectual banqueting, and delicious feasting. By a Guest. 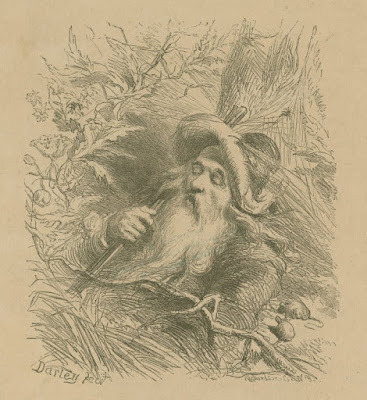 The memory of Rip Van Winkle--He being dead yet "sleepeth." H. H. Martin. Stanwix Hall--A noble monument of Dutch enterprise--May it never be rent in twain, but may it sustain the rents made by time, and in time may its rents sustain it. From Giles F. Yates, Esq. of Schenectady--Holandesche Aenelach--Tot welcken wy lieden danckbearlyck verbonden syne, voor het eersten, upbouwen der steden Beverwyck, Nieuw Amsterdam en Schachnachtada, tusschen de jaren 1610 en 1617, by onsen voorouderen. Zegenigen tot Haren gedachtenesse! Translation. Dutch Enterprise--To it we are indebted for the settlement between the years 1610 and 1617 of the three cities, Albany, New York, and Schenectady. Blessed be the memories of their founders! Dr. B. P. Staats. The sons of St Nicholas at Fort Stanwix in 1777, and at Stanwix Hall in 1833--The former shook the bush and endured real pain. The latter caught the birds and have champagne. By a Guest. The commercial prosperity of our happy country, the best evidence of a well regulated government.